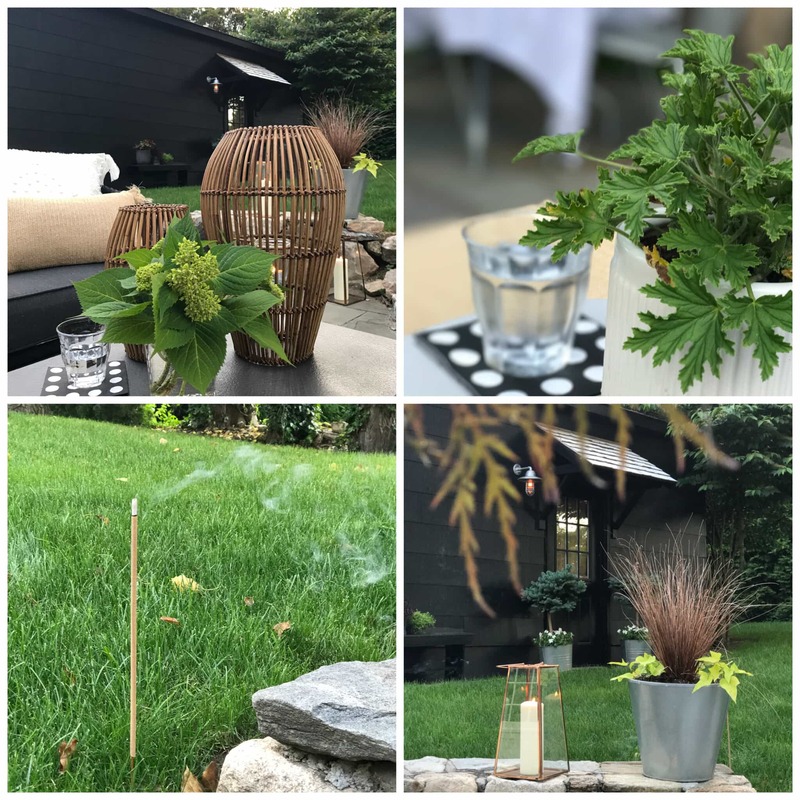 Currently it’s 27º and snow is in the forecast with temps eventually returning to normal for this time of year by end of day…As we get closer to patio weather, I’m updating this post with a few ideas that I found on World Market. We put away our outdoor furniture from Target for the winter, but I’m so ready to put it back out. It’s still available and 15% off if you select in-store pickup. The Club Chairs and Loveseat are so comfortable. We used this table also from Target. Since we were going with a more black, white, gray metal look, we used spray paint to paint the base black and the top gray metal. 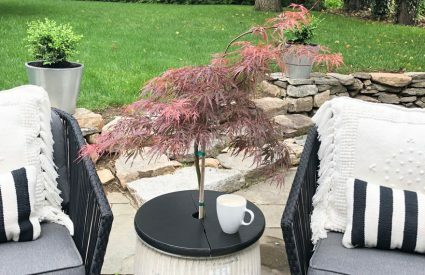 Now the $71 table looks beautiful and works with the rest of the outdoor furniture and planters. 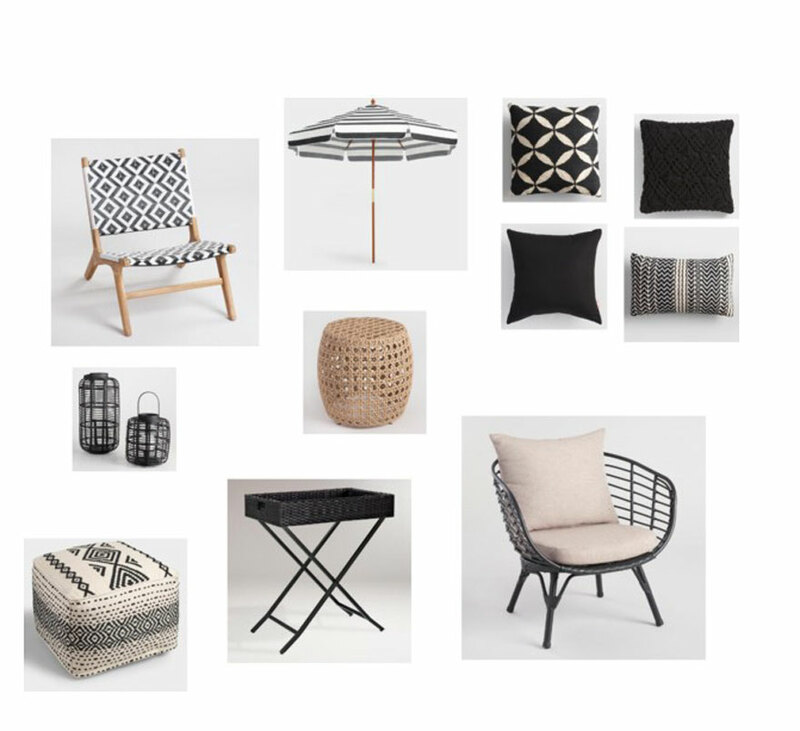 I’m loving new outdoor in black & white from World Market. 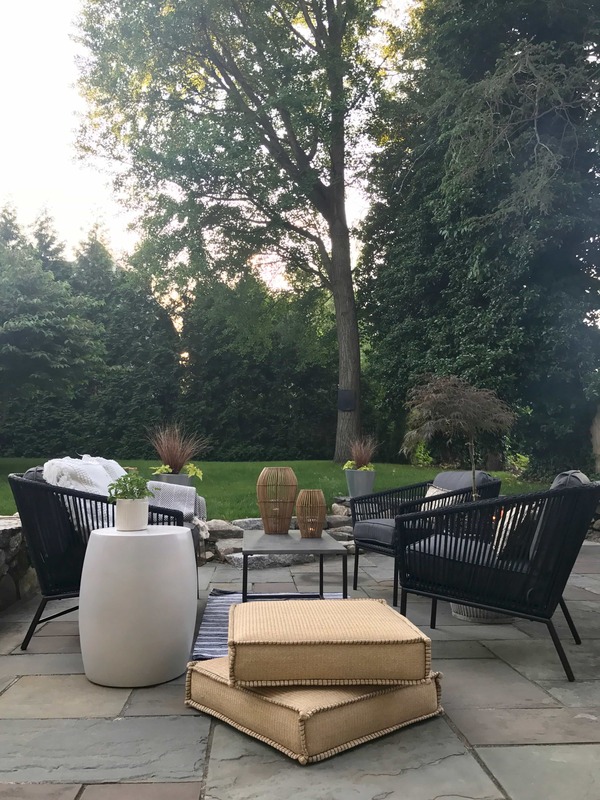 You can create a beautiful and comfortable outdoor space for a lot less than you might think if you look for deals on the big items. 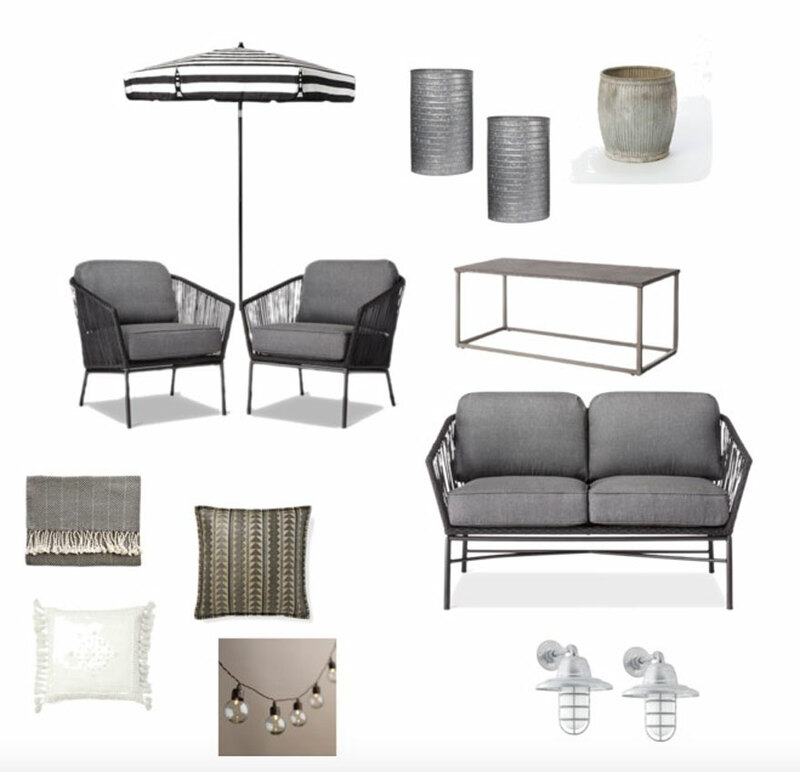 We found the Standish outdoor furniture at Target and then splurged on a few things from Serena & Lily. We are loving our patio so much more this year with the addition of new outdoor furniture. 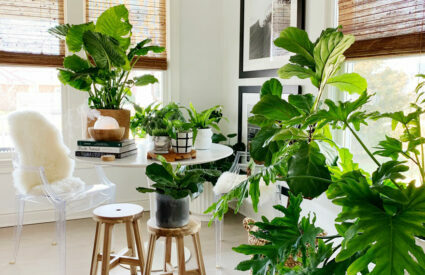 I first saw the chairs on Emily Henderson’s blog. 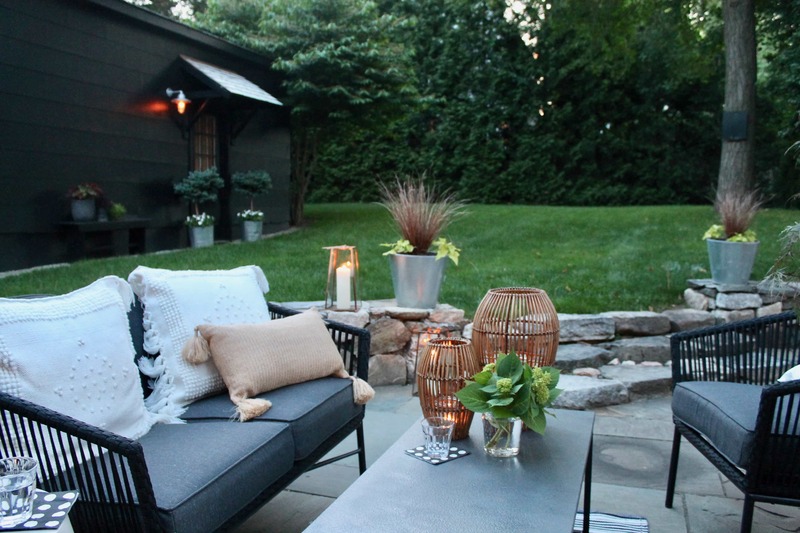 I may have never looked twice if I had seen them online, but when I saw how great they looked on Emily’s deck with her eclectic style–I decided to give them a chance. We chose the Standish Loveseat and pair of chairs from Target. They are so comfortable and of course we love that they are black. The cushions are a dark gray. We mixed in a few pieces from Serena & Lily like my favorite pillows–the Montecito in white. The floor pillows, Sagamore side table and rattan lanterns are also from Serena & Lily. The rectangular table in the center is from Target. We chose it for the simple lines and size, but the color was all wrong. It was sort of beige. Not terrible, but Brent painted the top and base and it looks more like it fits with the look we were going for. The galvanized pots are from Ikea and Terrain. 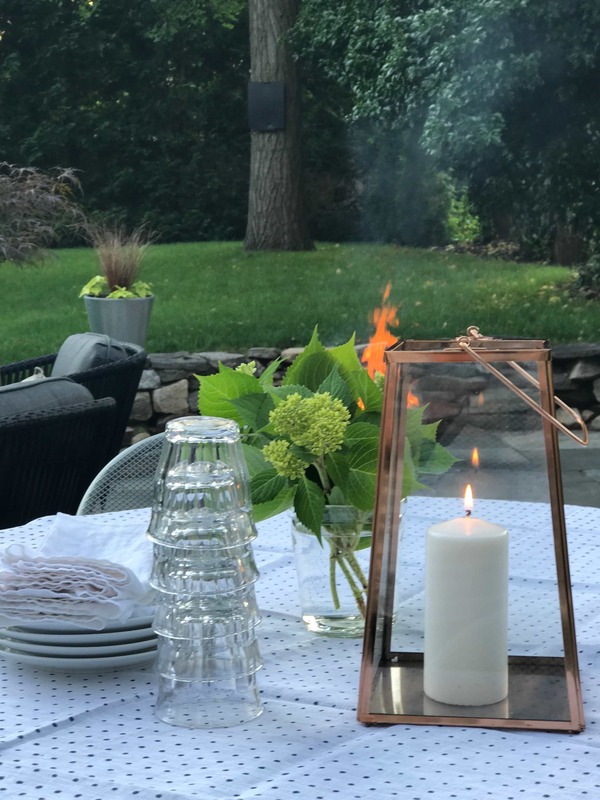 A linen tablecloth from Serena & Lily, a copper lantern from Target and a beautiful evening is all you need to make it special for family and friends. A few garden clippings for the table, Fly-Away Sticks that help keep the mosquitoes away and lanterns from Target and Serena & Lily. Our backyard and patio has become out favorite place to hang out these days. When we first purchased our in-town house, the yard was small and overgrown. By taking out some of the trees and shrubs, it has really opened up the yard and made a huge difference. We used to live a little further out and had two acres. Much of it was wooded and wet lands. We much prefer our in-town location and now our backyard and patio feels like a little oasis. 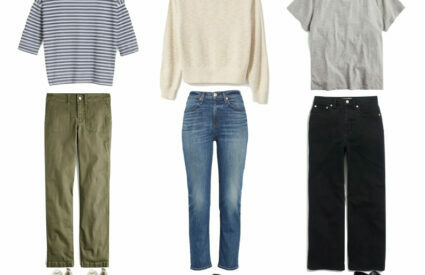 You can see our before right here. Hope you had a great weekend and enjoyed your outdoor space! HI! 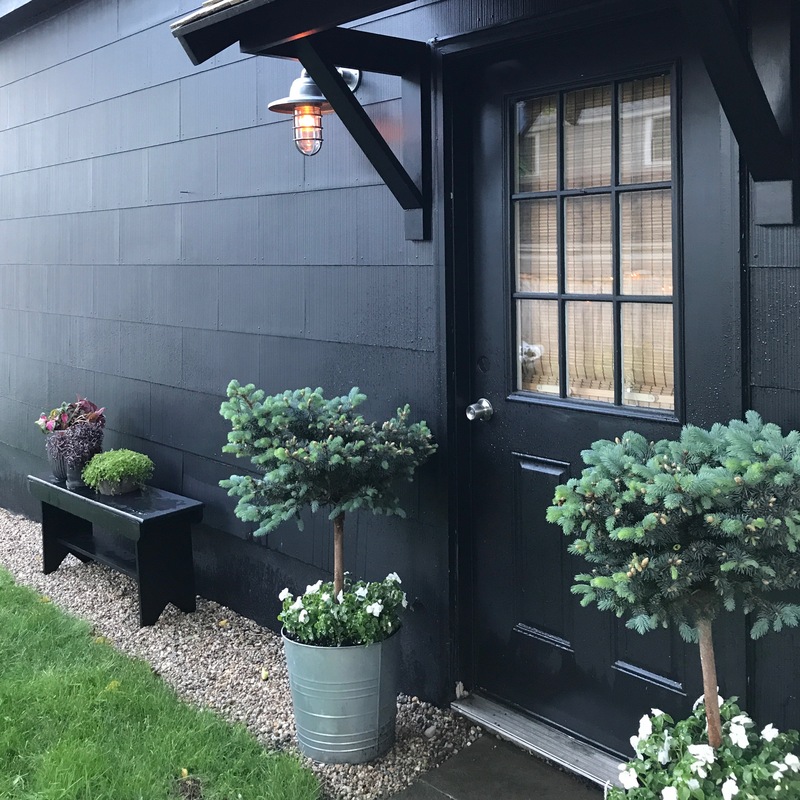 Forgive me if you’ve already addressed this question, but I cannot find anywhere where you mention the black paint you’ve used on the garage, nor the white paint you used on some of your interior. 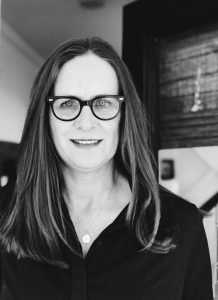 Can you help me with this information? Thank you so much. We used Behr paint just called “black” and we think it’s semi gloss, but when I get home I’ll send you a photo of the can. If you are thinking of going with black paint, I would highly suggest this paint. It surprises us that it has not faded much at all in three years.